Five Not Guilty, Two Left Waiting . . . 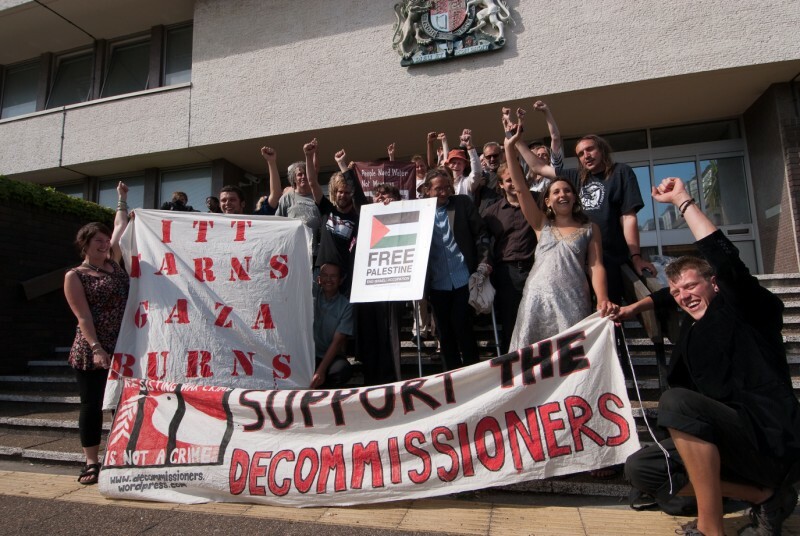 Yesterday five of the seven remaining EDO decommissioners, on trial in Brighton for damaging the EDO arms factory during last year’s attack on Gaza, were found unanimously not guilty. The other two verdicts are expected Friday, as the court isn’t sitting today (Thursday 1st June). The defendants successfully argued in court that they were acting to prevent war crimes against the people of Gaza. EDO MBM have been shown to be complicit in these crimes by supplying parts for F16 aircraft. The court case will continue on friday support is still very welcome. This entry was posted on July 1, 2010 at 11:00 am	and is filed under EDO. You can follow any responses to this entry through the RSS 2.0 feed. You can leave a response, or trackback from your own site. Well done on an excellent result. Please let me know if you need anything from my transcript of the trial. regards, Jock. Congratulations to everyone involved, I hope you know what a fantastic boost to our moral this is. Everyone is so impressed.